Appearing for the first time at the RHS Chelsea Flower Show, Breakthrough Breast Cancer draws inspiration in the garden from the genetic research and breakthroughs into breast cancer being funded by the charity. Based on a DNA helix shape, a hard stone pathway was crossed by a ribbon of soft pink planting including Iris sibirica and Myosotis sylvatica. Water pools in the garden ripple every 10 minutes to represent the shocking statistics of women diagnosed with breast cancer in the UK. White stemmed trees and a green and white planting scheme create an ethereal feel with a sculpture by Rick Kirby symbolising the courage and dignity of all those fighting the disease. The designer lost her late sister-in-law to breast cancer in March 2014 and sought to help the charity raise funds for its research and help reach its £100 million target. 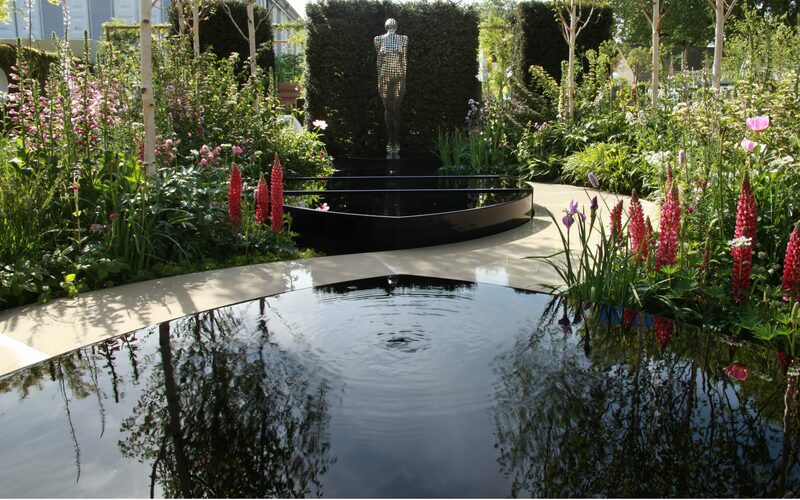 Ruth returned to RHS Chelsea having had her last Fresh garden with Cube 1994, awarded an RHS Gold medal in 2013. Designed by Ruth Willmott. Built by Cube 1994. This RHS Silver Gilt and People’s Choice Award winning garden was built by Cube 1994. Months of research went into sourcing and creating the bespoke water-features that symbolically rippled every 10 minutes. The garden took 10 days to build and received an incredible response from the public, raising £17,000 for the Breast Cancer charity. Watch the build process here.